Each year the Oppenheimer Toy Awards on Toy Portfolio give us guidance as to our toy purchases. Each year, it seems, it is harder to pry our grandchildren from their electronics to play outside. It is more important than ever to find outdoor toys that will grab attention away from electronics. Here are some award winning options. An Oppenheim Toy Portfolio Gold Seal Award 2018 winner, described as “perfect for beach or sandbox, this lightweight dump truck is designed with older toddlers and young preschoolers in mind. 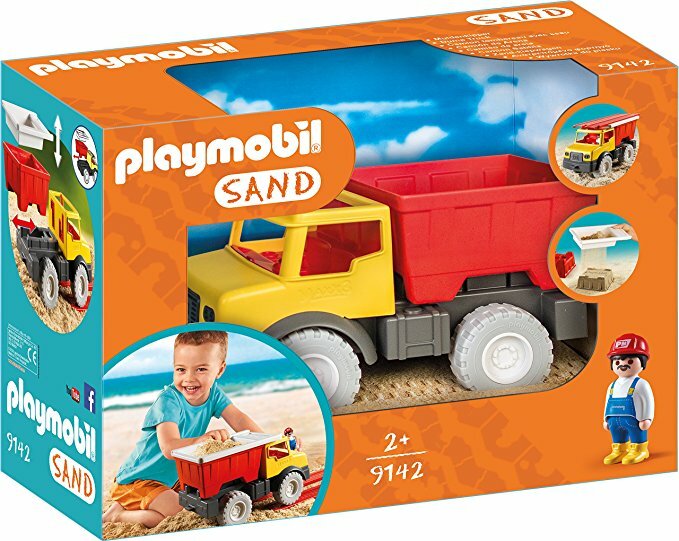 It not only has works as a truck, it comes with a sieve for sifting the sand, two treads for rolling the truck over, a construction guy for dramatic play, and a back-end that lifts off and can be used for making a mud pie brick.” Buy at Amazon. An Oppenheimer Toy Portfolio 2017 Platinum Award Winner, it is described as follows: “It is giantic—over two feet long and ready for indoors or out in the sandbox play. Toddlers are fascinated by big trucks and here’s one they can take charge of in the early pretend play. This has a tilt-able bed, big tough wheels and a separate red convertible that may need to be delivered somewhere or taken for repair. Unlike so many “talking” trucks, this one will only say and do what the player wants it to do. It’s a child-controlled vehicle that can also carry and deliver whatever your big pretender imagines.” Buy at Amazon. An Oppenheimer Toy Portfolio 2017 Platinum Award Winner, it is expensive. Instead of the kitchen we buy so many grandchildren, this is an interesting and modern alternative. It is very comprehensive and described as, “It has a complete kitchen back there, with play sink, microwave oven, fridge and soda fountain. There’s a cash register, note pads for taking orders, a chalkboard for writing the menus (or flavors) of the day, a flip out counter, order bell, and steering wheel with a working horn. As if that wasn’t enough, the sign on top can be turned to make this a food truck with hot dogs or reverse it and sell ice cream. There’s a trash can that comes loaded with 40 play food accessories that will surely add to the fun of running a business. Okay, that’s the good news. Now here’s a little side note. This requires assembly and a power tool, since our builder found that not all the holes were pre-made and he tells us it took considerable time. Marked for 2 and up, we’d say older 2s will like this very urban style setting for pretend, but the sweet spot is probably more like older 3s and 4s and even 5s. Kids can use this for a puppet stage, too.” Buy at Amazon, where it is an Amazon Choice Toy. An Oppenheimer Toy Portfolio 2017 Platinum Award Winner, it is described as a combination of a cozy coupe and Big Wheel, for those grandchildren “ready for a pedal toy.” Buy at Amazon. Buy at Amazon where it is given five stars. Not only is it hard to maneuver the new Oppenheimer Toy Award website, when we get to older grandchildren we need to expand our search. Beach Toys Sand Toys Set for Kids, Newisland 9-Piece with Shovels Bucket in Reusable Zippered Bag, More Durable (9 PCS Beach Toy Set) Described as better quality than most. Baby and Toddler and Up. EvoCrest Binoculars for Kids w/ Shock Proof Rubber Body – 8×21 High Resolution Lenses w/ Clear Focus Perfect for Bird Watching, Outdoor Play, Educational Learning – Toys for Boys and Girls. Described as good quality and durable. Age 3 and Up. Finally, Learning Express just released its best spring and summer outdoor toys. Take a look at their choices. Maybe a giant soccer ball, a scooter and helmet or lazer tag. Once we get into items such as scooters that come in different styles and colors, it might be best to bring the grandchild along to a Learning Express store near you. I always immediately get someone to help and direct us quickly to outdoor toys only. Yes, we can! We can find toys to get our grandchildren outdoors and away from electronics this Spring and Summer 2018.